At this time, my husband and I are not saving for our kids’ college education in a traditional 529 account. Instead, they each have a custodial investment account where we put their money from their birthdays, grandparents, etc. I’m not going to insist that their money is a college fund. I want them to be an active part of choosing their investments and deciding what to do with them. When they are 18, they will have access to their accounts. If they want to use their money for college, great. If they want to use it to start a business, awesome. If they want to use it on a down payment on a house, more power to them. I’ll give advice if they ask for it, but for the most part, the money is theirs to do with as they please. I used to value a college education so much, and it is important to have depending on the career field you want. For example, my husband is months away from finishing medical school. You can’t be a doctor without a college degree. Noted. But, if my kids want to go into business or be professional actors or dancers, who am I to say they have to go and get an overpriced four year degree? I don’t know about you, but the price of a college education is just completely ridiculous. I went to a fancy school and then to graduate school and now I am working in a totally different field. I spent six years studying Civil War History, and I honestly could not tell you the dates of the major battles anymore. My whole world is blogging and personal finance writing now. Isn’t it important for my kids to know what they want to do rather than spend years working towards a degree they might not ever use? Furthermore, what if my kids start a business at age 12 and by age 18 it’s already making six figures? I wouldn’t insist a child go to college if they already have a career going for them. What if they want to travel abroad, volunteer, or do something else? I’m fine supporting my children in their dreams, as long as they are hard-working, inspiring, and open minded. I won’t support a kid who won’t leave my house, get a job, or stay away from abusing alcohol or drugs. But if my kid presents me with a proposal of what they will do and learn on their 1 year abroad, I have no problem with them taking a year off before attending school. Maybe everyone should do such a thing in order to find out where they really belong. Know that I write this post coming from a place of gratitude. I know I’m fortunate to be born in the USA, have the resources to send my child to college if I want to or not, and give my kids will choices in life. I know not every child can afford to choose between travel or investing in a business or doing something else entirely if they want to. What I want them to have mostly is gratitude for all these gifts that life has afforded us, appreciation for their parents who worked hard to give them choices, and a willingness to make the world a better place regardless of whether or not that includes college. I especially don’t want them to fall into the mindset of thinking that they must apply to and attend the best college possible, regardless of cost. My views are changing on higher education. Will my kids go to college? Probably. But that doesn’t mean I’m going to be saving just for that. I’m saving for their future, and whatever that may be is up to them. What are your thoughts on saving for college for your children? What do you do with extra money your children receive for holidays and birthdays? Why do you think we so often associate going to college as the only way to be successful? We are saving some money for our daughter in a 529 right now. I personally believe that the price of college will begin to stabilize before she gets there after the student loan bubble bursts. However, I won’t be putting the money that she receives into it. That is her money and she should have the right to do with it what she wants so I like the idea of the custodial account. We aren’t planning on paying for her college 100%. If she decides to go, I think it is good that she be on the hook for part of it. I had to pay for mine 100% and it gave me a very valuable perspective on debt and the cost of things that I want to make sure she gets as well. Definitely. If they are responsible for a portion of it, they are less likely to waste it! Interesting perspective! I’m a huge advocate for a college education but you’re right about never knowing for sure what your children will do in the future. I’d be pretty darn proud if my kiddo was making six figures by 18. But I’d also be just as proud if he gets a college degree and works up the career ladder like everyone else. I love the idea that you shouldn’t save for college, but save for the future. Food for thought! Although we are saving in a 529 and will continue to do so, I can respect your veiwpoints and actually agree with them. You make some very good points. From my perspective, going to a state college can’t be “devastatingly wrong”. It might not be right – but it cant completely alter someones life in a negative way. On the other hand, not going to college could be devastating to their longterm future for some. For others, going to college is probably a dumb idea. Those who start businesses, learn valuable trades, etc. But from a purely statistical and probabilistic view, that’s not likely to happen. Enjoyed reading! Thanks for sharing! Exactly. And, the thing is, there are so many ways to go to college now. You can get a college degree online on the go while you travel too. I just want them to be open minded and not be stuck in this rigid view of how they *should* do things. I have college funds started for my kids in a 529 plan, but it won’t be enough to pay for 4 (or more) years of college. I have come around to the idea that it is good for kids to pay for at least some college expenses, especially after the first year or two. I am encouraging my kids to go to college- I think this opens up so many opportunities and provides experiences that you can’t really get any other way. Good one Cat! 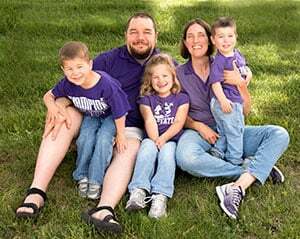 While I am saving for my son’s education in a 529 (since day one), I’ve slowly changed my views on paying wholly for his education (I smell a post coming on). I used to think I should pay for his education, but slowly my mind is turning away just due to the high costs. I wouldn’t be where I am today without the benefit my parents afforded me. While I don’t use my college education anymore, it got me in many doors. I took it from there. There are some who don’t need to go to college, but as my brother found out, he could increase his earnings if he had a degree. He didn’t go to college (was a mechanic), but his employer told him how much he “could” make with a basic degree. He got it and started making much more. Until the corporate world gets off the view of “you need a degree to succeed,” then I have to prepare for that world. Thanks Grayson – That totally makes sense. I know I want them to pay for part of it so they have some sense of ownership! We don’t have children yet but I would like to think that I’ll do the same thing as you. Even though I have 3 college degrees, I don’t think that a person should be valued based on whether or not they have one. There are other ways to be successful! Exactly – they can be future bloggers! We contribute to a 529 plan for each of our kids. The contributions would likely not cover the full costs of college but it should hopefully be enough to make their costs manageable. Yeah every little bit helps right! My views on an education for Will have definitely changed over the years. I think the education and job markets have changed so much in the last 10 years that I can’t imagine what they will look like in 10 years when he is going to make that decision. We are saving in a 529 plan for him because we get the tax benefit in NY, but I am fine with him using the money however he sees fit to improve his career/life options. Bill and I joke all the time that we wish he would just go to trade school to become an electrician or something. We don’t have kids yet buy I have thought about this often. I worry that boxing savings into a 529 account would limit the ability to fund other things like business start up costs, or paying for rehab if our kids go a different route. Gotta contingency plan! Lol And while college was a given for my sister’s and me, we all wanted to pursue jobs that would require a degree so that also was in line with the goals of college. If we have a child who wants to be a mechanic, why should they go to college unless they also want to pursue Engineering or Business to start their own firm or broaden their tinkering horizons? My folks socked away cash in non-college savings plan accounts and I think that’s what we will do as well. Yeah that’s how I felt about 529s as well. We might do it later when it can benefit us tax wise but ultimately we’re happy with the way things are going right now. Love your thoughts here Cat – especially with helping the kiddos play a more active role in deciding how to handle what’s being saved and being open-minded as to what they might do. We do have 529s for the kids and are more than open to shifting funds from one to another if one chooses not to go to college. This’ll likely require some other form of saving on our parts, but the key is to offer that flexibility so they can make the best decision based off their available options. It was expected of me to go to college, but little direction as to why or what other things I could pursue. We want it to be different for our kiddos. 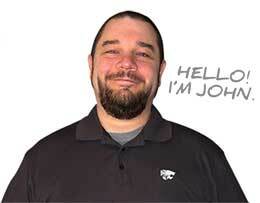 Thanks John – I love that and agree that we should offer them flexibility. This is a great outlook on your kids’ future. I also studied history in school, and while I can occasionally pluck some historical dates out of my head for use in playing along to Jeopardy, I have never used the focus of my college education during my career. Having a broad definition of success will encourage your children to define it for themselves, and help them find what they truly want to do. I think you’ve found an excellent solution to helping them without restricting them. Thanks Gary! I remember talking to you about our shared history passion – very cool. 🙂 And thanks so much! 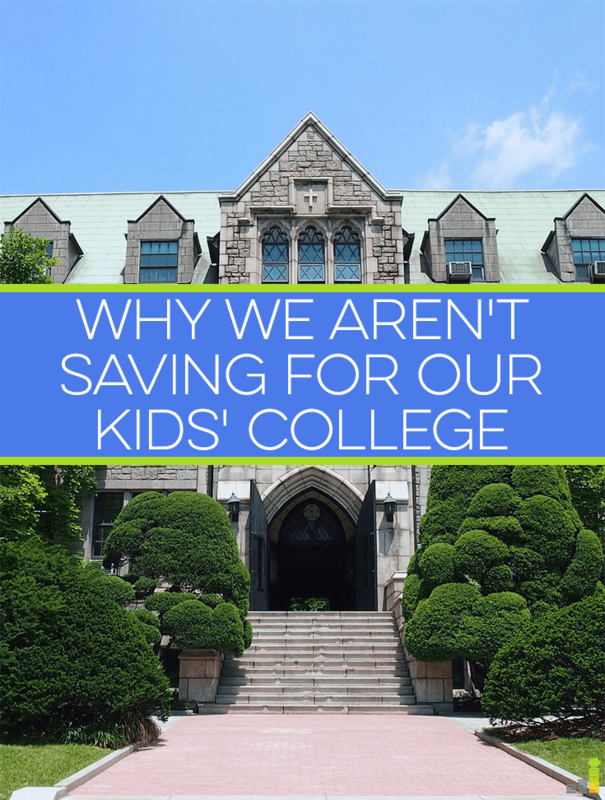 We’ve started doing our savings in an ESA just because it seems like a good bet that somewhere down the line one kid or another will want to go to college, but like you, we see a lot of advantages to encouraging our kids to think of alternative options outside of the traditional college route. We will be happy to help them transition to adulthood as they build their careers even if that means they don’t go to college. Yeah I feel the same way – I just want to help them transition and be independent! I agree with you on so many points. 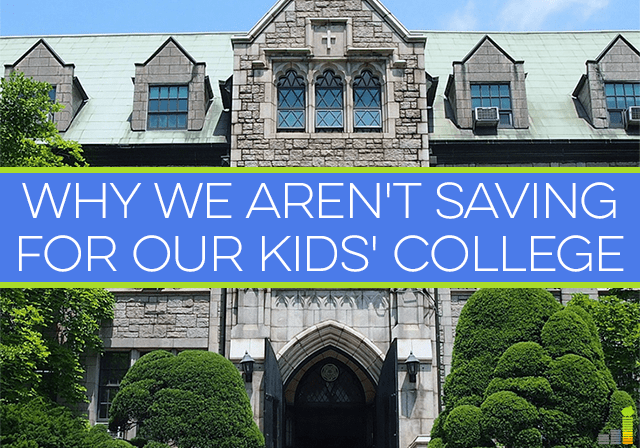 We are not saving for our children’s college, either. Instead, we are focused on ensuring that we will be mortgage-free by the time our oldest would be graduating high school. That way, we can cash-flow tuition if our kids decide to attend college, while also be encouraging them to work, attend part-time, and attend public institutions. I am very unsure about what the future holds, especially in terms of the economy, and I just don’t trust fancy financial vehicles sold by big banks (and I’m an accountant!). I agree with the basic premise of what you are saying and while we are helping our college daughter, we do not have the financial means to pay for its entirety. Having learned a lot the last couple years about financial aid however, I think it’s important to point out a disadvantage to your plan. When calculating financial aid that colleges give you, they will look at the custodial accounts as your childs assets and require them to use the majority of it before giving them aid. Money placed in 529 plans are looked at as parental assets and while a certain amount of it is taken into account for financial aid it is at a much lesser %. I know that 529 plans limit flexibility but there are also many other ways to use them if your child decides not to attend college. We originally had custodial accounts but quickly changed them to 529 plans before our daughter went to college. If you are as fortunate as we are to live in a state that rewards 529 savers, you can get 20% of what you put in as a tax rebate. Great incentive.